Gale, Kilmer schools celebrate new & improved SMART care clinics. Gala draws capacity crowd of 350 to support access to primary care on city’s North Side. (Washington, D.C.) Congresswoman Terri Sewell (D-AL) and speakers on behalf of Senator Orrin Hatch (R- UT) joined multi-disciplinary leaders from the education, healthcare, and private sectors on Wednesday, December 5, at the Dirksen Senate Office building on Capitol Hill for a Congressional Breakfast Briefing to hear the latest findings from Dr. Liza Cariaga-Lo of Brown University, regarding the nationally recognized SMART Student Health Model (School Health Model for Academics Reaching ALL Transforming Lives). In light of the sad news of the passing of President George H.W. Bush, special permission was granted for the event to continue on Wednesday, which was a National Day of Mourning. The gathering was dedicated in honor of the life of President Bush. Sewell, U.S. Representative for Alabama’s 7th congressional district, attended the annual event in support of the work of her local constituents and praised the approach and results that SMART has offered to students and community members in her district and across the nation. 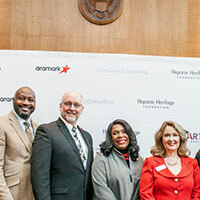 “I am very proud to be a supporter of the SMART Model, and want to thank all the sponsors: CVS Health, Aramark, Ginn Group Consulting, and especially the University of Alabama, Dr. Karl Hamner, Dr. Peter Hlebowitsh, and Dr. Julia Boothe,” said Congresswoman Sewell. “When you do prevention on the front-end you actually deliver better outcomes on the back-end. It’s so important that we spend our money wisely, the limited resources that we have, and why I am such a passionate advocate for this Model is because I know it can work; it has shown itself to work, not only in Chicago but in rural Alabama, and for that I am very grateful to those that have delivered and implemented this Model, but I would love to scale it throughout my district,” Sewell added. The keynote speaker, Cariaga-Lo, presented her new Formative Evaluation White Paper, “SMART Leadership: Transformative Change Agents and the Essential Culture and Climate for Achieving Health and Education Outcomes,” as the culminating experience of the inter-disciplinary, multi-sector SMART Symposium, a 2-day event that aims to inspire and edify the grassroots professionals implementing the SMART Model. Dr. Cariaga-Lo, a Harvard educated Psychologist, is the former Vice President of Diversity and Inclusion at Brown, Founder and CEO of LCLO Group, and has previously held positions at Yale and Harvard. This was her second formative evaluation of the model, which has greatly impressed her, as she noted: “The Model also shows great promise in ultimately reducing the financial burden of physical and behavioral health problems on students, their families, and the communities where they live,” she said. “SMART Leaders who have committed themselves to addressing adaptive challenges, in recognition of the centrality of the Whole Child in their solutions will reap great rewards for students, public education and health outcomes, that will be significant and transformational,” said Cariaga-Lo. 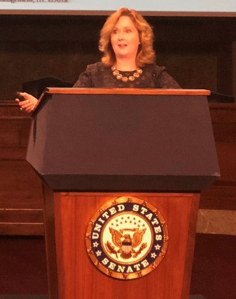 The SMART Congressional Breakfast Briefing and Symposium highlighted the leadership and culture required to sustain this transformative solution that is delivering dramatic outcomes for entire school populations in both urban and rural flagship sites, from grades pre-kindergarten–12. The annual event is hosted by the Hispanic Heritage Foundation, SMART’s multi-cultural advisor, and Ginn Group Consulting (GGC), architect of the Model, and is sponsored by CVS Health and Aramark. SMART is a school health solution dedicated to improving academic achievement in order to break the cycle of poverty, creating a new, antecedent component on the health care continuum. The award-winning public-private partnership that fuels the SMART Student Health and Wellness Model is revolutionizing health care in public schools. This best practice Model is being successfully operated in selected urban and rural regions, including Chicago and rural Alabama, with plans to expand to other cities over the next 5 years. SMART was developed in Chicago in 2013, and the flagship SMART Center at Sullivan High School has now entered its sixth year of operation. There, the Model has a tremendous track record of routinely consenting an average of 98% of the student population and providing care for 100% of those students, thus significantly increasing attendance by 3-4%, and improving the school’s academic metrics and rating, all at lower operational costs than traditional models. Active Care, a key component of the SMART Model, is deployed via Active Access, a dramatically changed capacity for impact, routinely reaching 95–98% of students, without increasing net costs. Sullivan Principal Chad Adams credits the SMART Model with influencing the culture of his school, “As I reflect on the turmoil I encountered while working to turn around a failing school, I now realize that having the SMART clinic was the primary differentiator for us in that process,” he says. “I want to thank the many disparate stakeholders who came together, willing to make changes that allowed for this true innovation,” said Melanie Ginn, President and CEO of Ginn Group Consulting. “The proof of concept we have now in the SMART Model shows that the trajectory of young lives can be positively supported when we break down silos between health and education and work together to swiftly design and deliver meaningful, lower-cost solutions.” This past summer, Ginn, presented the SMART Model’s latest metrics and documented results to The Republican Task Force on Hispanic Affairs, founded and led by Hatch. Ginn was also recently recognized with the “Transformational Leader Award” for the quantifiable impact of the SMART Model in Chicago at the 2018 Heartland Health Centers’ From the Heart Gala. 2018 expansion of the SMART Model has included new, rural SMART clinics opening in Pickens County Alabama, in partnership with the University of Alabama and Dr. Julia Boothe, and two additional Chicago clinics with Heartland Health Centers as the medical provider partner at Gale Community Academy and Hibbard Elementary School. Additional school districts in the Midwest and Northeast participated in this year’s SMART Symposium as they explored the possibility of opening their own SMART Clinics in the 2019–20 school year. Dr. Peter Hlebowitsh, Dean of the College of Education at the University of Alabama, recommends the institutionalizing of the SMART Model stating, “When noting the evolution of the public-school system and its hallmark features, I can see the day when SMART Centers are as normative within public education as cafeterias—one in every school,” he says. Ginn Group Consulting (GGC), led by President and CEO Melanie Ginn, is a nationally recognized design management firm with a proven track record in delivering exceptional outcomes and incisive analysis for clients. GGC brings objective and insightful perspective and expertise to review, research, develop, and deliver advanced business and legal analysis, strategies, and solutions. Learn more at www.ginngroupconsulting.com. recognized: Gwenn Rausch, CEO Heartland Health Centers (HHC), medical provider partner for SMART sites in Chicago; and Javonte Barber, Utilization Manager at the Sullivan High School SMART Student Health and Wellness Center. Each honoree has played a unique leadership role in ensuring the success of SMART Student Health and Wellness Centers in their regions. For each of these leaders, “success” is, in part, defined by each of their significant efforts that resulted in positively impacting the trajectories of children’s lives. SMART stands for School Health Model for Academics Reaching ALL Transforming Lives. “When Dr. Boothe made the commitment for her personal physicians’ practice, Pickens County Primary Care, to become the medical provider partner to bring SMART to Pickens County, commencing with the PK-12 Schools in Reform, Alabama, she literally enabled the opportunity to develop a successful, sustainable blueprint for not only her own Pickens County, but for all students living in rural counties across Alabama and the country. Julia has been a gracious, wise and extraordinarily strong partner that we are blessed to have in this journey,” exclaimed Ginn, President and CEO of GGC. “Dr. Hamner was the first to reach out to me to ask me to come to Alabama and evaluate the feasibility of bringing SMART to rural Alabama counties, to support academic success of students who have such amazing potential, but who have such limited access to needed resources. Since that day, Karl has been a tireless champion of the model on behalf of his region’s students. His heart and passion for this work have had a lasting impact on GGC’s capacity to imbed the model and bring in needed funding from CVS Health and Aramark, as well as other key partners, like the University of Alabama, and Dean Hlebowitsh,” noted Ginn. The “Reaching All, Transforming Lives” Award is in the shape of a blue crystal iceberg, which symbolizes SMART’s “Whole Child” approach to health care. SMART builds long-term relationships, through an Active Access approach, with the students and their families and school faculty and staff, to understand and address the often-unseen risks to their wellness that could lie beneath the surface, negatively impacting their academic and future success in life. Dr. John Brandon of Pickens County was also given a special recognition at the gathering for his dedication and volunteer service in establishing SMART Clinics in Pickens County. Jami Leveen, Aramark; Dr. Karl Hamner, Univ. 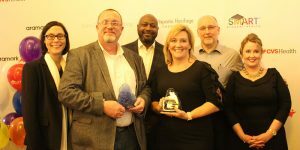 of Alabama; David Casey, CVS Heath; Dr. Julia Boothe, Pickens County Primary Care; Ernie DuPont, CVS Health, and Melanie Ginn, Ginn Group Consulting, celebrate with the Alabama awardees. 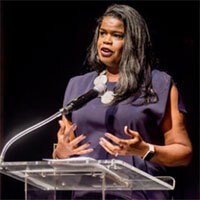 “I hope these beautiful awards will serve as a wonderful reminder to these individuals of their continued strength as leaders that recognized the possibilities, continue to help us challenge the status quo, and thus bring “Whole Child” care to so many more students whose lives have truly been transformed,” said Ginn. The gathering was a celebratory dinner topping off the day-long SMART Symposium, a meeting of disciplinary leaders from the education, healthcare, and private sectors interacting in order to highlight the leadership and culture required to sustain this transformative solution that is delivering dramatic outcomes for entire school populations in both urban and rural flagship sites, from grades pre-kindergarten–12. The annual event was co-hosted by the Hispanic Heritage Foundation, SMART’s multi-cultural advisor, and GGC, and sponsored by CVSH and Aramark. In attendance were key members of CVSH’s Workforce Development, David Casey, Vice President, Workforce Strategies and Chief Diversity Officer and Ernie DuPont, Senior Director of Workforce Initiatives, as well as Jami Leveen, Director, Communications and Strategic Partnerships at Aramark. The following day, all the SMART Award Recipients and Alabama and Chicago’s SMART participants from the health and education sectors were welcomed at a Congressional Briefing at the Dirksen Senate Building, which included greetings from Senator Orrin Hatch’s (R-UT) office, a personal address praising their efforts by Congresswoman Terri Sewell (D-AL), and a white paper presentation on the leadership and culture that has created the success of the model, by Dr. Liza Cariaga-Lo of Brown University. SMART is a school health solution dedicated to improving academic achievement in order to break the cycle of poverty, creating a new, antecedent component on the health care continuum. The award-winning public-private partnership that fuels the SMART Student Health and Wellness Model is revolutionizing health care in public schools. This best practice Model is being successfully operated in selected urban and rural regions, including Chicago and rural Alabama, with plans to expand to other cities over the next 5 years. The flagship clinic was funded by Legacy Sponsor, CVSH, whose support continues to this day, now joined by Aramark with a 5-year commitment to sustain and expand the Model. The SMART sites in Reform, AL have already experienced similar success, even in their first three months of operation. (Washington, D.C.) Two Chicago health care leaders recently received the first “Reaching All, Transforming Lives” awards from SMART Model architect Melanie Ginn of Ginn Group Consulting (GGC) and Ernie DuPont of CVS Health (CVSH), at the semi-formal reception and dinner following the 2018 Annual SMART Symposium, on December 4th in Washington, D.C. 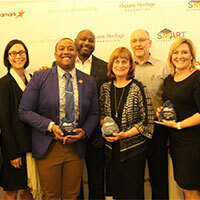 Recipients of the awards were Gwenn Rausch, CEO Heartland Health Centers (HHC), medical provider partner for SMART sites in Chicago; and Javonte Barber, Utilization Manager at the Sullivan High School SMART Student Health and Wellness Center. Two of the honorees’ SMART colleagues in Alabama were also honored: Dr. Julia Boothe, Founder of Pickens County Primary Care, medical provider partner for SMART sites in rural Alabama, and Dr. Karl Hamner, Director of the Office of Evaluation of the University of Alabama College of Education. Each honoree has played a unique leadership role in ensuring the success of SMART Student Health and Wellness Centers in their regions. For each of these leaders, “success” is, in part, defined by each of their significant efforts that resulted in positively impacting the trajectories of children’s lives. SMART stands for School Health Model for Academics Reaching ALL Transforming Lives. Three years after having established the SMART flagship site in Chicago, Heartland Health Centers was selected as the new medical provider partner, under the leadership of CEO Rausch. At that time, all of the existing SMART Clinic employees were transferred to HHC for a seamless transition that allowed for no disruption of care, continued improvements and care coordination for the students, as well as utilization growth. “Under Gwenn’s visionary leadership, and the outstanding expertise of her Chief Medical Officer, Laurie Carrier, M.D., Medical Director, Jay Mayefsky, M.D., COO Letty Sargant, and School Health Director, Megan Erskine, her extraordinary working relationship with GGC has fueled the success and expansion of the Model to three other schools, with plans for more,” stated Ginn, President and CEO of GGC. In note of Barber’s award, “Although Javonte was not a member of the original core team that worked with GGC to establish the flagship SMART Clinic, his infectious joy, deep commitment to students, and powerful organizational and leadership skills have made him an instrumental and beloved member of the SMART Transformation Team, and led to his promotion to a management role,” Ginn shared during the presentation of his award. 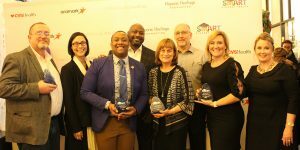 Jami Leveen, Aramark; Javonte Barber, Sullivan High School SMART Center; David Casey, CVS Heath; Gwenn Rausch, Heartland Health Centers; Ernie DuPont, CVS Health; Dr. Julia Boothe, Pickens County Primary Care, and Melanie Ginn, Ginn Group Consulting, celebrate with the Chicago awardees. The gathering was a celebratory dinner topping off the day-long SMART Symposium, a meeting of disciplinary leaders from the education, healthcare, and private sectors interacting in order to highlight the leadership and culture required to sustain this transformative solution that is delivering dramatic outcomes for entire school populations in both urban and rural flagship sites, from grades pre-kindergarten–12. The annual event was co-hosted by the Hispanic Heritage Foundation, SMART’s multi-cultural advisor, and GGC, and sponsored by CVSH and Aramark. In attendance were key members of CVSH’s Workforce Development, David Casey, Vice President, Workforce Strategies and Chief Diversity Officer and Ernie DuPont, Senior Director of Workforce Initiatives, as well as Jami Leveen, Director, Communications and Strategic Partnerships at Aramark. The following day, all the SMART Award Recipients and attendees were welcomed at a Congressional Briefing at the Dirksen Senate Building, which included greetings from Senator Orrin Hatch’s (R-UT) office, address praising their efforts by Congresswoman Terri Sewell (D-AL), and a white paper presentation on the leadership and culture that has created the success of the Model, by Dr. Liza Cariaga- Lo of Brown University. SMART was developed in Chicago in 2013, and the flagship SMART Center at Sullivan High School has now entered its sixth year of operation. There, the Model has a tremendous track record of routinely consenting an average of 98% of the student population and providing care for 100% of those students, thus significantly increasing attendance by 3-4%, and improving the school’s academic metrics and rating, all at lower operational costs than traditional models. Active Care, a key component of the SMART Model, is deployed via Active Access, a dramatically changed capacity for impact, routinely reaching 95–98% of students, without increasing net costs. Sullivan Principal Chad Adams credits the SMART Model with influencing the culture of his school, “As I reflect on the turmoil I encountered while working to turn around a failing school, I now realize that having the SMART Clinic was the primary differentiator for us in that process,” he said. (Tampa, Florida), Oct. 9, 2018 – Melanie Ginn, CEO of Ginn Group Consulting (GGC) is pleased to announce that Juan Pablo Sanchez, a public health professional and Gates Foundation Millennium Scholar, is joining the team as the Manager of Business Development for the firm’s SMART™ Student Health and Wellness Model. Through his role with SMART™, Sanchez is responsible for ensuring successful implementation of SMART™ model start-up operations, training, and quality oversight of the regional expansion sites, replication clinics, and operating agencies. He will serve as a key liaison for GGC’s internal, inter-disciplinary team of business, clinical, technical, marketing experts and peer mentors, and their collaborations with local stakeholder groups, including educators, medical provider partners and new SMART™ Team cohorts. Sanchez’s insights, expertise and passion for improving population health outcomes will well serve GGC’s current focus to codify, expand and sustain the nationally recognized SMART™ model and its highly successful SMART™ Student Health and Wellness Center flagships in Chicago and rural Alabama. “As we ever seek to increase the reach of SMART™ to improve the academic, and thus workforce success, of more at-risk children, Juan Pablo’s powerful dedication to the connections between health and education, and our proactive population health approach, will be an amazing asset to our work” said Ginn, GGC CEO and architect of the SMART™ Model. In addition to his role with GGC and SMART™, Sanchez serves as a campus-based leader for the Gates Millennium Scholars Program, is a member of the USF Health Executive Board and is Director of Communications for the University of South Florida Public Health Student Association Executive Board. He was a 3-time volunteer for the Hispanic Heritage Awards, and was a Senator for the College of Public Health at the University of South Florida Student Government. Furthermore, Sanchez has had the opportunity to participate in an education abroad opportunity where he analyzed the health and education systems in over 20 countries through Semester at Sea and hopes to use this experience to bring creative and holistic ideas to the SMART™ Model. His experience as a Congressional Health Intern for Congresswoman Nanette Barragán in Washington, D.C. will also help develop policies that will assist in the replication of the SMART™ Model nationwide. Sanchez became acquainted with Ginn through Antonio Tijerino at the 2017 Inaugural SMART™ Symposium and Congressional Briefing co-hosted by the Hispanic Heritage Foundation, and sponsored by Legacy Funder, CVS Health. SMART™, which stands for School Health Model for Academics Reaching All and Transforming Lives, is a solution dedicated to improving individual student and school academic outcomes by proactively delivering Active Access to physical and behavioral health care interventions within K–12 schools. It possesses a five-year track record of uniquely outstanding reach, results and impacts. Currently, there are SMART™ Centers in several schools in Chicago and rural Alabama, with plans to expand to other cities over the next 5 years, of which Sanchez will be a key coordinator with stakeholders and partners, as directed Ginn. “I could not be more honored to be on such an elite team of professionals that have a profound interdisciplinary approach to solving our nation’s health and education gap by being driven by data, the latest evidence-based practices, and developing a universal approach with the SMART™ Model that can be replicated in any community. Also, it is a great privilege to be working directly for Melanie Ginn, the Architect of the SMART™ Model, because of her passion for making sure children around the country are healthy and enabled to succeed academically and beyond,” said Sanchez. As the direct product of being granted access to education by the Bill and Melinda Gates Foundation to break the cycle of poverty in my family, I have personal experience with the barriers that are removed and the impact that the SMART™ Model can have on communities across the country. For this reason, I am passionate about the opportunity to assist with the expansion of the SMART™ Model and being a part of transforming communities one child at a time. The individual stories about the impact that the SMART™ Clinics have had on students resonate with me deeply and make the work that we are doing that much more rewarding and inspiring. SMART™ was developed in Chicago in 2013 and recently marked 5 years of successful operation at its flagship site. The flagship site has routinely reached 98% of the student population, increasing attendance by 3-4%, and improving the school’s academic metrics and rating, at lower operational costs than traditional models. The data collected from this nationally-recognized model has been shared in Washington, D.C. to members of Congress as a best practice innovation by Dr. Liza Cariaga-Lo, Vice President for Academic Development, Diversity and Inclusion at Brown University, (as a Formative Evaluation). Ginn recently presented the SMART model’s impressive metrics to The Republican Task Force on Hispanic Affairs, founded and led by Senator Orrin Hatch (R-UT). The SMART™ model recently received a 5-year, multi-million-dollar grant from the Aramark Charitable Fund to support development of SMART™ Student Health and Wellness Centers in K–12 schools across the country. Sanchez will also have a key role in the upcoming Second Annual SMART™ Congressional Briefing and Symposium in Washington, D.C. on December 4th and 5th, 2018 hosted by Ginn Group Consulting and the Hispanic Heritage Foundation and sponsored by CVS Health and Aramark. Ginn Group Consulting (GGC), led by President and CEO Melanie Ginn, is a nationally recognized design management firm with a proven track record in delivering exceptional outcomes and incisive analysis for clients. GGC brings objective and insightful perspective and expertise to review, research, develop, and deliver advanced business and legal analysis, strategies, and solutions. Learn more at ginngroupconsulting.com. Loyola University announced today it is donating $25,000 to support the construction of a SMART Health and Wellness Clinic at Gale Academy. Loyola’s Acting Provost and Chief Academic Officer, Margaret Faut Callahan, presented the check to Gale Academy Principal Augustine “Augie” Emuwa and me today at Loyola’s Water Tower Campus. This generous one-time grant allows Gale to immediately begin construction of the clinic, which the school hopes to open in time for the beginning of the academic year in September. I brought the health clinic initiative to the attention of Loyola’s administrators and requested a $25,000 grant from the university, which was the amount needed to start construction this summer. They generously agreed to my request. I joined Principal Emuwa (second from left) in accepting on behalf of Gale Academy and the Rogers Park community Loyola’s $25,000 donation to the SMART clinic. Presenting the donation on behalf of the university was Provost and Chief Academic Officer Margaret Faut Callahan (second from right). Also representing Loyola were Vice President for Government Affairs Phil Hale (far right) and Director of Community Relations Summur Roberts (center). This grant represents the largest one-time cash donation the university has ever provided and is reflective of Loyola’s continuing and growing commitment to Rogers Park’s schools. I am grateful for the university’s generosity. Heartland Health Centers will be the medical provider at the clinic, offering sustainable, academically-focused care, in fidelity to the SMART model. Ginn Group Consulting CEO, Melanie Ginn, developed the SMART model in collaboration with CVS Health. primarily low-income students. They deliver integrative, preventive and primary health care services and solutions-based behavioral health supports directly to the students, their families and the school faculty and staff. The principle underlying these clinics is that better mental and physical health leads to improved academic achievement and higher graduation rates, which are essential to breaking the cycle of poverty. Two 49th Ward schools already are home to SMART Student Health and Wellness clinics–Sullivan High School and Kilmer Elementary School. As a direct result of these health clinics, not only do the students and their families receive needed health services, but both schools have seen dramatic and immediate increases in attendance rates and academic achievement, as well as reductions in disciplinary referrals. Principal Emuwa witnessed first hand the success of the SMART model when he was assistant principal at Sullivan. When he took over as principal at Gale last year, Principal Emuwa enlisted the help of Ms. Ginn, who in turn consulted with CVS Health. After they conducted their due diligence, CVS Health agreed to provide $150,000 in seed money with the condition that Principal Emuwa and the school raise $150,000 in matching funds to make the clinic fully operational. Principal Emuwa immediately asked his local school council, local elected officials and community residents to assist him in his efforts. In true Rogers Park fashion, our community answered the call. State Senator Heather Steans and her husband, Leo Smith, kicked off the fundraising campaign with a generous $40,000 donation. Other donations large and small soon followed. Community residents organized a successful fundraiser and Gale parents gave what they could in increments of $10, $20 and $50, demonstrating the overwhelming community support for the proposed SMART Clinic. All told, our community raised over $100,000, an impressive amount, but still not enough to put the clinic over the finish line. The Loyola donation seals the deal and makes a health clinic at Gale a reality this year. As the relationship with Gale Academy strengthens, Loyola plans to expand opportunities at Gale for Loyola’s students, including teacher preparation and nursing clinical experiences as well as other forms of engaged teaching and learning. Through its Plan 2020 initiative, Loyola already has established several collaborative projects with Gale, including working with Gale’s teachers to ensure that they are professionally trained to implement Illinois’ “Next Generation Science Standards.” Loyola’s donation helped begin construction of the clinic, but we are still short of our goal to enable the SMART model to be fully implemented. If you haven’t yet done so, I urge you to make a donation to help make the Gale SMART health clinic completely operational, so that all Gale’s students can take full advantage of its services. Melanie Ginn, CEO of Ginn Group Consulting, presented the SMART™ Model and its unique 5-year record of success improving educational and health outcomes for public school students. (Washington, DC) The U.S. Senate Republican Task Force on Hispanic Affairs featured the SMART™ Model for Student Health and Wellness as its focus on the topic of Health for its May agenda. Melanie Ginn, architect of SMART™, presented to the Task Force as well as others on the agenda including Mr. Secretary Alex Acosta, U.S. Secretary of Labor, members of the Republican National Committee and other key leaders concerning Hispanic livelihood. 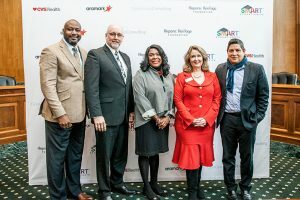 SMART™, which includes the Hispanic Heritage Foundation serving as its multi-cultural advisor, was developed out of a private-public partnership between CVS Health, as funder and thought leader, Ginn Group Consulting (the architects of the Model), local school districts, and partner medical providers. The Task Force on Hispanic Affairs, founded and led by Senator Orrin Hatch (R-UT), seeks to ensure the needs of the Hispanic community are considered in policy and legislative debates, as well as appointment and program concerns. Founding members also include Senator John McCain (R-AZ), and former Senator Bob Dole (R-KS). Joining Ginn for her presentation was Jean Papagianis, principal of Joyce Kilmer Elementary School in Chicago and Roberto Callejas, Chief of Staff, Hispanic Heritage Foundation. Principal Papagianis testified to the remarkable impact the SMART™ Model has had for her school and her students. Over the past year, her school’s attendance has improved by three percentage points, a dramatic and unprecedented increase, which she attributes to having the health clinic as a crucial asset. Ginn and Papagianis also met with Senator Hatch’s office after the Task Force presentation to further discuss the SMART™ Model. 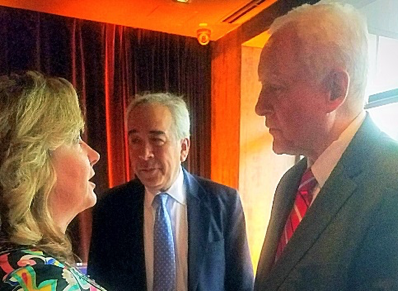 That evening, Ginn had the opportunity to meet with Senator Hatch at a private reception hosted by the Hispanic Leadership Fund. Ginn spoke to the committee about the culturally responsive SMART™ Model’s 5 years of success in improving the educational and health outcomes of entire public school student populations. SMART™ proactively addresses the educational and health needs of all students in the building, but is particularly impactful for special and at-risk populations that face unique barriers to success. Ginn Group’s research shows that Latinos are the largest and most rapidly growing ethnic minority in the U.S., and due to various acculturation challenges, reading readiness and proficiency suffer: only 42% Latino kindergartners are reading ready and by 4th grade only 84% of Latino students show reading proficiency. SMART™ engages Latino students and families by providing physical and behavioral interventions to support their educational success, closing the opportunity gaps they face, and ultimately offering them the best chance for a positive life trajectory, higher socio-economic status, and the benefits of good health as adults. The quantifiable and substantive results of the Model’s success were officially presented to members of Congress last May in a formative evaluation white paper, The SMART Student Health and Wellness Approach: A Holistic Model for Achieving Health and Education Outcomes in Support of Diverse Communities by Brown University’s Dr. Liza Cariaga-Lo, Ph.D. Since then, the academic and health metrics have continued to improve as year 5 of the Model’s success numbers are just now becoming available. Launched in 2013, the SMART™ Model distinguishes itself from traditional school-based health care in significant ways. First, it focuses on academic outcomes as its purpose and is completely integrated into the educational environment. SMART™ staff work closely with educators and school administration to ensure they support the goals and needs of the students, functioning as an integral part of the school community. Second, SMART™ deploys what it calls an “active access” strategy to deliver “active care”—employing social workers and psychologists alongside physicians, nurse practitioners, and administrators to continuously and proactively reach out to and build relationships with students. This “whole child” lens addresses not only the physical health, but also the mental health and emotional well-being of students. The innovative SMART™ Model will again be presented at the Second Annual SMART™ Congressional Briefing and Symposium, hosted by CVS and the Hispanic Heritage Foundation, in Washington, D.C. on December 4th and 5th, 2018. SMART™ is a school health solution focused on student academic achievement through active access in the delivery of preventive and integrative physical and behavioral health with the goal of ensuring the wellness of every student in an educational setting. SMART™ is built on the proven connections between health, education, and workforce opportunity; its creation celebrates the powerful alliance of public-private partnerships that fueled this innovation.